We welcome you to browse around and learn all you can about our wonderful Elementary School here at Cornerstone. CLICK THE GRADE BELOW TO LEARN MORE! At Cornerstone, we believe our Special Skills classes to be an incredibly important asset to our school. Our elementary students look forward to these classes, and enjoy the opportunity to learn new skills. In addition to our every day curriculum, Special Skills classes give students a chance to expand their creativity and find new and exciting strengths. Click here to meet your Special Skills Teachers! Our Elementary students have a course called Exploring Art, and meet two - three times per week. In this class, our students review art elements and principles of design. Students are introduced to new ways of using design and creating works of art. Our PE program has a primary goal to develop students' fundamental movement skills within a variety of developmentally appropriate games, dances, and gymnastic activities. Personal and social responsibility, self-directed learning, and problem solving skills are also reinforced throughout our elementary physical education curriculum. All students have access to a fully equipped computer lab, complete with filtered Internet access, which is overseen by teachers. Our students go through a premier, web-designed curriculum. This curriculum focuses on innovative, results-oriented solutions with a singular, overriding purpose: to improve students learning. Our Spanish classes are designed to teach our students conversation, vocabulary, and grammar. The K-5th classes are taught two - three times per week for one quarter. Our elementary students look forward to our annual extra curricular activities, as well as multiple field trips, and special events. We strive to supplement our curriculum with exciting, and memorable moments throughout the year. Quarterly we come together to recognize those students who have done an outstanding job academically, as well as celebrating their character with Cougar Character Awards. It is our pleasure to express how proud we are of their hard work and dedication to living a life for Christ. Our Barnes & Noble Book Fair is held in early December. A percentage of all purchases go directly to Cornerstone during the event, and surrounding days online using a special code. This evening is full of excitement including PJ story time, games and card-making, and a free dress pass earned just for attending. Every Wednesday our Elementary School comes together for a morning of worship. Our students and teachers sing songs, play games, and fellowship together as Pastor Maria brings them what the Lord has placed on her heart. This is a favorite part of the school week for our K - 5 students. Parents are always welcome! Celebrating the birth of Christ is a highlight of our year. We have a variety of Christmas performances, as well as our annual Holiday Festivities the day before Winter Break which includes a Gift Shop, Christmas craft, cookie decorating, and photos with Santa! The Daddy Daughter Dance is an event we look forward to in early Spring. Our parent committee works hard to plan a lovely evening for daddies and their little girls, year after year it is the talk of the school, and we are so grateful for all the hard work that goes into it. One of our first big traditions happens in September, the Fun Run and Carnival. Classes take turns jogging at a local park, and come back to spend some exciting time in the parking lot Carnival, including the much anticipated, Dunk Tank with our principal, Mr. Heyer. 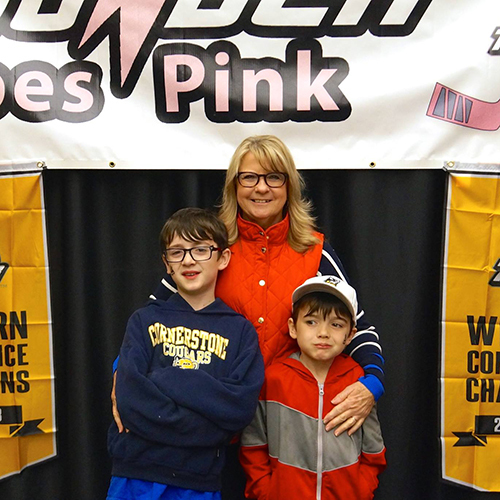 The Mother Son event takes place at the home of the Stockton Thunder, an evening of delicious food, games and prizes, and of course, hockey! Our moms and sons look forward to this each second semester, and our committee works hard to ensure a memorable evening for all. Throughout the year, Cornerstone holds pep rallies for our elementary school. They are fun, exciting, and incredibly loud! Students and staff love showing school spirit, as the Cougar Cheerleaders lead us in a variety of games, cheers, and an all around good time. The science fair allows our 5th and 7th grade students an opportunity to present and display projects which they have been diligently working on throughout the course of the year. Science fair projects demonstrate the students' knowledge of the scientific method through experimentation, data collection and analysis. Display boards allow students the opportunity to present results and showcase their creativity. Winners from our school Science Fair go on to represent Cornerstone at the Association of Christian School International at the Northern California Regional Science Fair. Each Spring our Elementary students are led in daily chapel experiences, based upon a chosen theme. Our students, teachers, and parents alike, enjoy this fun and exciting time to learn more about our Lord and Savior. Pastor Maria leads them in song, games, activities, and a daily lesson. Cornerstone has special Spirit Days throughout the year, in addition to Spirit Week. The students are allowed to show their school spirit with a variety of fun and creative prompts. It is always exciting to see how our school rallies together, whether it is Pajama Day, Crazy Hair Day, or Pink Day! The week before Thanksgiving Break, our classes participate in special Thankful Lunches. They learn about the meaning behind Thanksgiving, as well as arts and crafts, and enjoy delicious meals together with friends and family.